@Slightspeed Be safe out there during the fires. Luckily I'm 50+miles from them but the air quality is still impacting us over here. I'll contribute for sure to the page. Thanks so much for the kind wishes, and the donation. Hope to ride out in Simi Valley tomorrow. Almost every other road we ride has been impacted by fires, either this year or last year. They just got new guard rails up around Lake Casitas from last year. 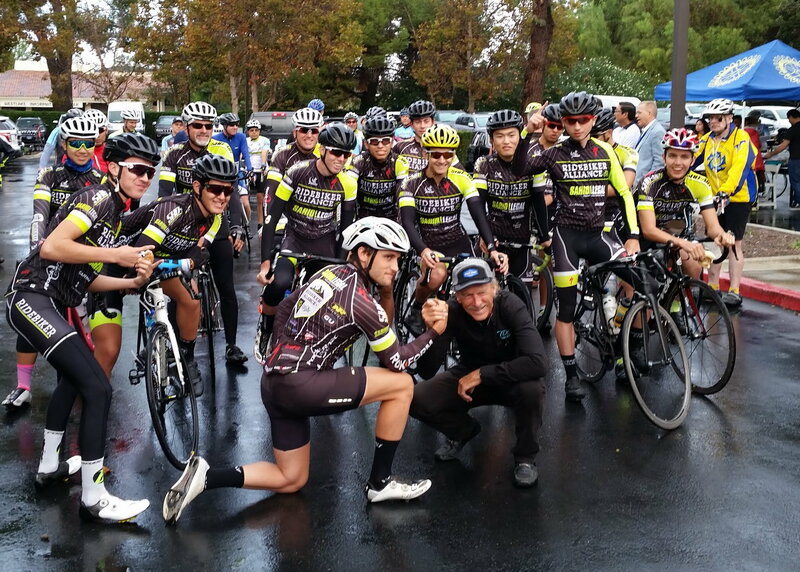 George Chester with his young rider developnent team, he's in front center, right. Installed a new (used) cartridge type headset in the '74 Paramount. Cups are in so far, as of this writing, with the final assembly of them to come soon. I'm also cleaning and polishing the paint as it was used for rain duty for a little bit before I took it offline. Get some gloss into it, which I can see in the fork. I'll post pictures at some point. As far as rebuild plans, I don't know yet. The '80 Trek 410 is performing quite well and I don't want to break that up just yet. I think I'll mock some non-traditional components up for the Paramount and see how it looks. 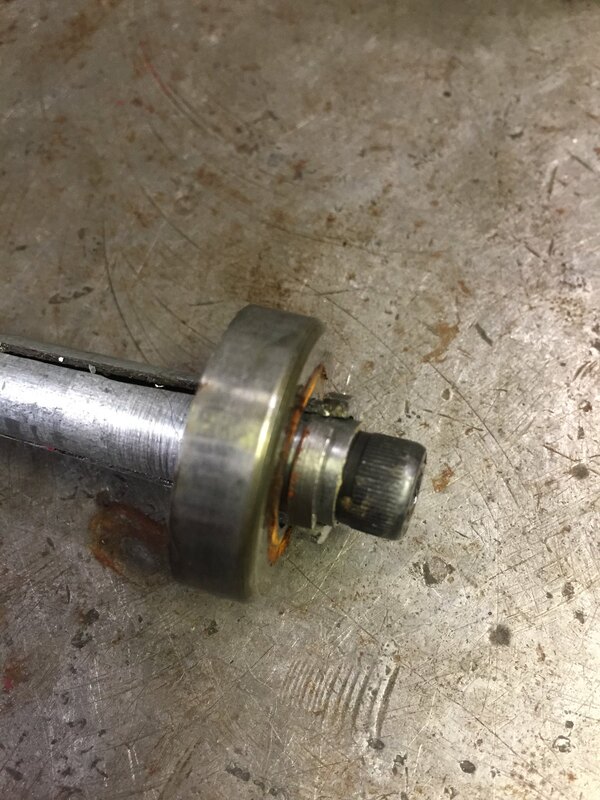 Removed a badly pitted bearing cup from a Campy Record hub. Here is the offender....one of the worst I've seen. Here is the tool for the job. I made this puller a few years ago.....'copied a design I saw on the web. The "lips" of the puller fit inside the ID of the bearing cup. 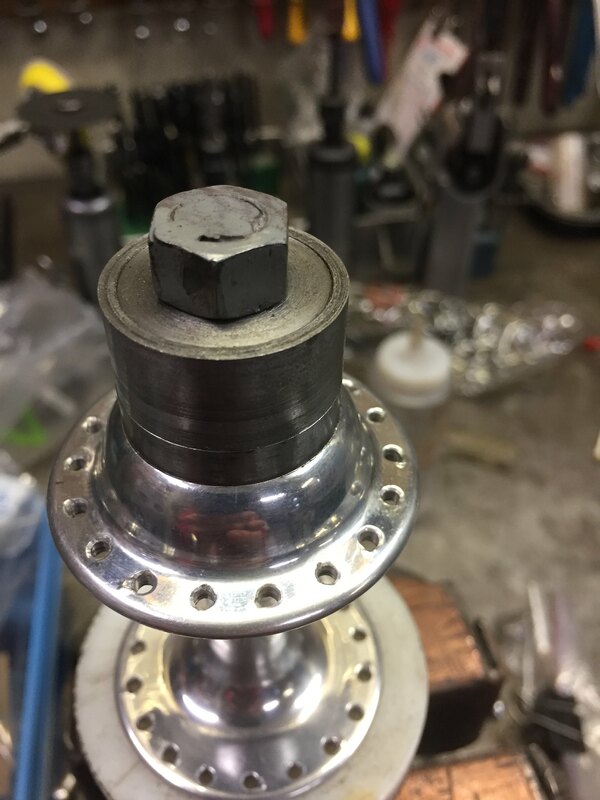 Once inserted, tightening the allen head bolt draws in a cone that expands the "lips" for a tight fit to the ID of the bearing cup. With a tight grip on the bearing cup, I use a hodge podge of spacers between the hub and the large nut. 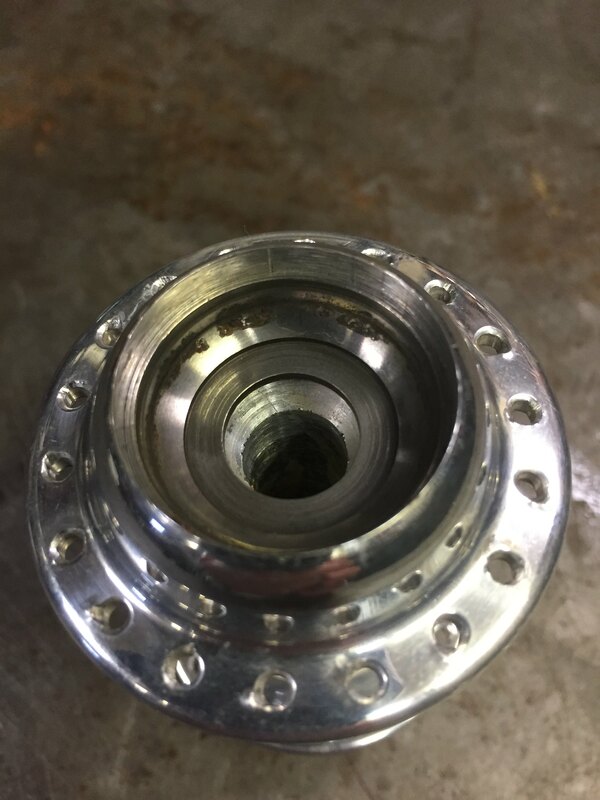 Tightening the large nut pulls the bearing cup out of the hub. Last edited by Dean51; 11-17-18 at 12:45 PM. Great work, well done! I have always thought a pilot bearing puller would do the trick for this as well. 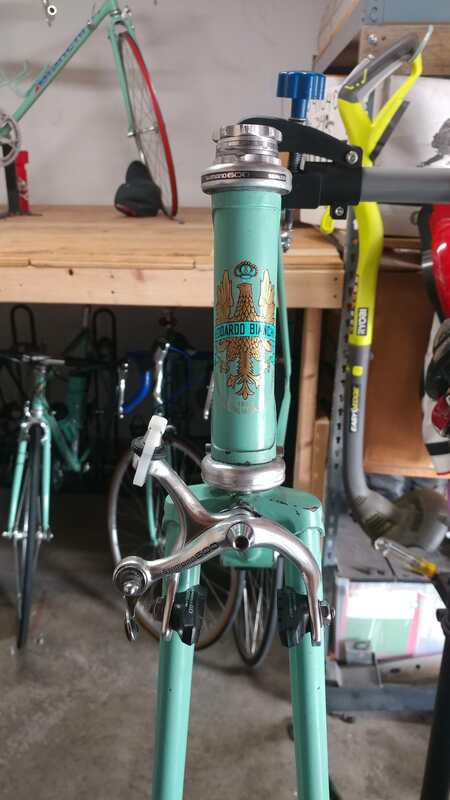 Put the head tube decal on the Bianchi Squadra today. Sick as a dog the past 2 days so I got time on my hands. Last edited by malcala622; 11-28-18 at 11:08 AM. In from a very chilly AM ride on the Gazelle SS, poured a cup of jo and started on this build..
First snow of the year this morning so after my haircut I headed to the LBS to get a couple of brake cables for my PH10L project. 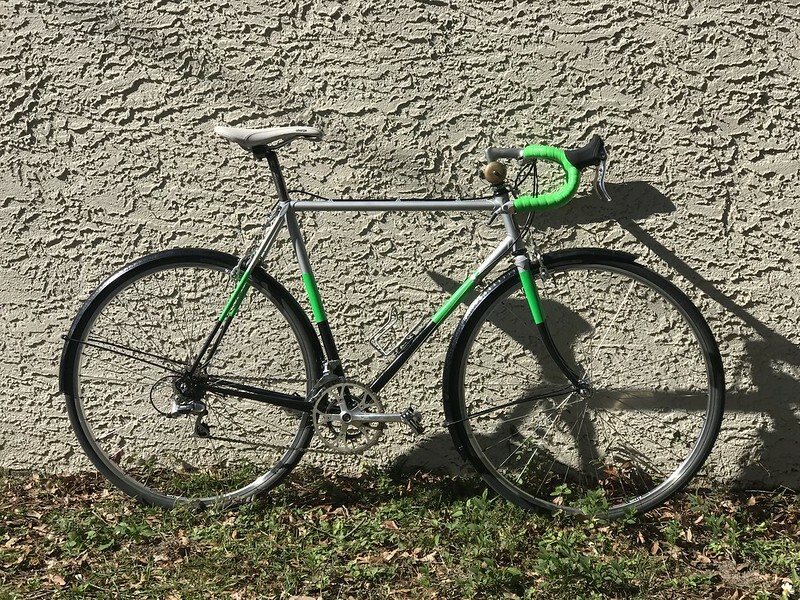 The owner was there and I asked if he had any old Suntour long cage rear derailleurs since I decided to put a triple crankset on the errand bike.. He showed me the box of old stuff in the back and said "the Suntour, if any", will probably be at the bottom. Lucky me I found a V-GT (missing the lower jockey wheel which is no big deal as I can make it work with parts derailleurs I have). 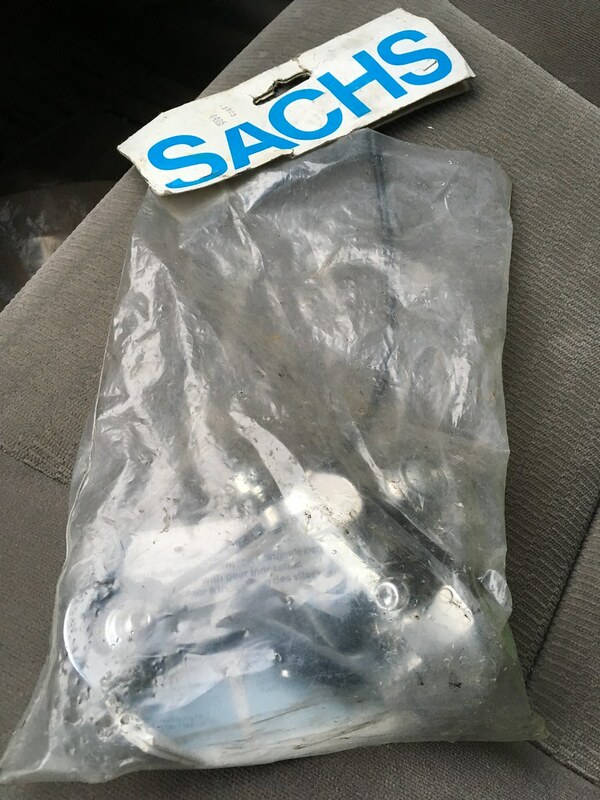 Then I see a bag in the box that says Sachs. 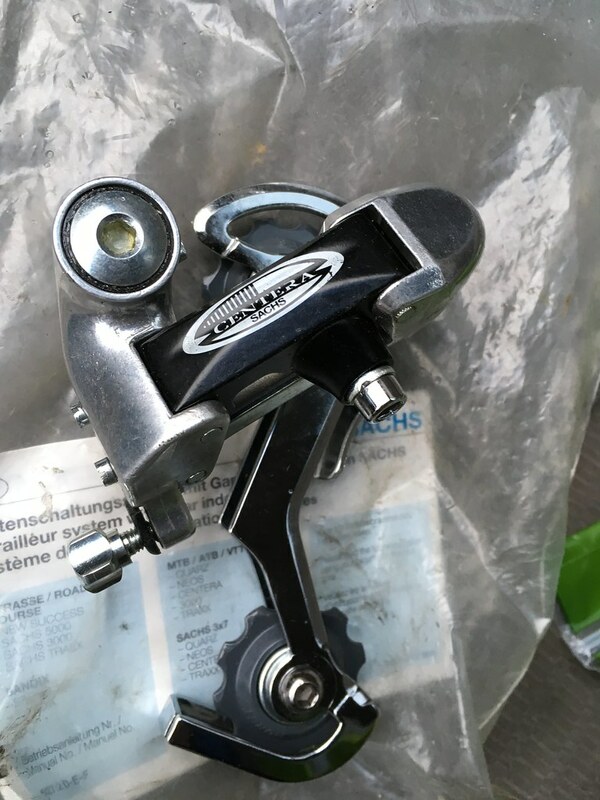 I pull it out and it's a NOS Sachs Centera long cage derailleur. Not the lightest but I may put it on the the project bike and keep it French. Then the owner says "wait a second". He walks back to a shelf and pulls something off and goes "oh, it's a short cage". Of course, my curiosity is up now and I ask what it is. 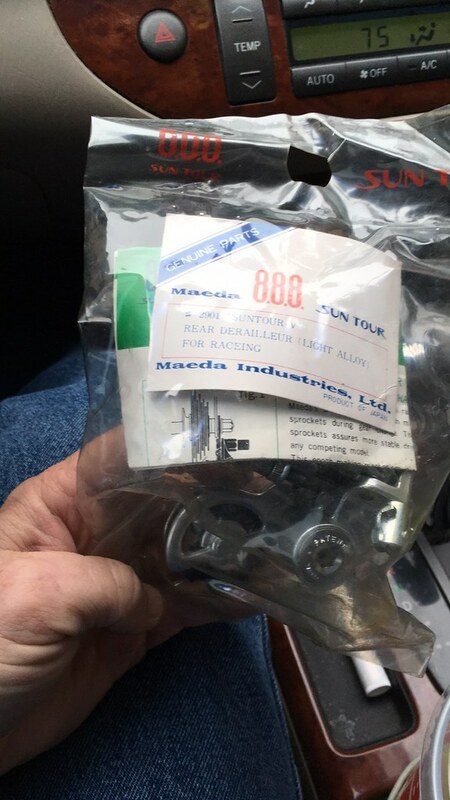 He brings over a NOS (sealed package) Suntour V rear derailleur. Again, not the lightest, but it's NOS. One of the guys that worked at the shop in the 1960's and early 1970's had brought it in. He'd been hanging on to it for probably 45 yrs. 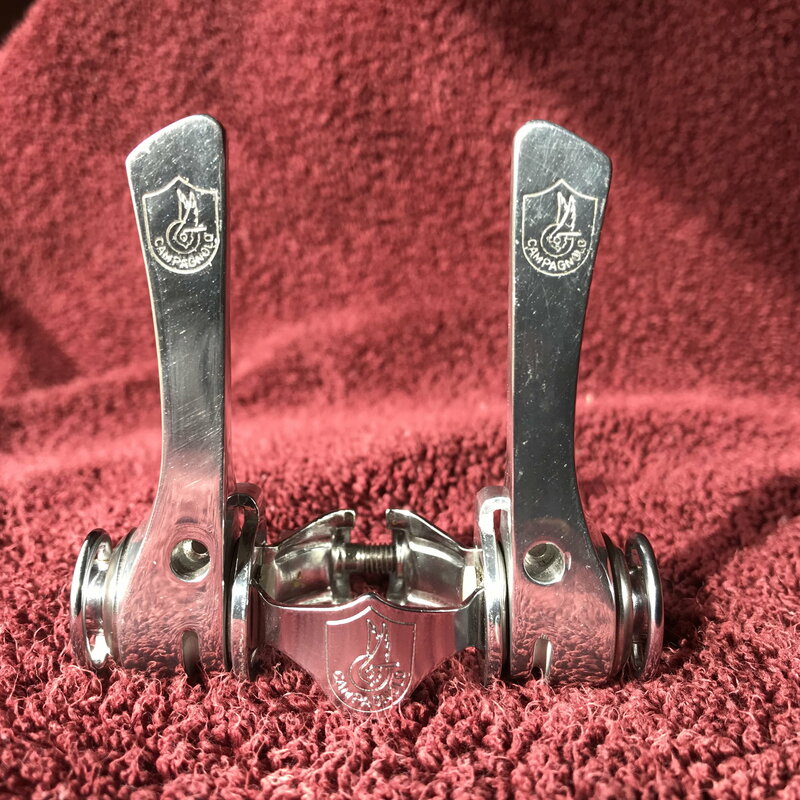 Total for the day was $25 for two NOS derailleurs and the V-GT. Last edited by scozim; 12-01-18 at 02:29 PM. well, with all these nice and shiny treasures, not sure if my recent project fits in. On of my recent bike hunts included a Canadian made Leader, just your standard run of the mill steel touring bike I am guessing late '80 early '90s. 1/2 of the crank was gone, no tires and the rest worn to the point that I decided to use whatever parts I had around and salvaged from other bikes to make a little vintage inspired roadster. 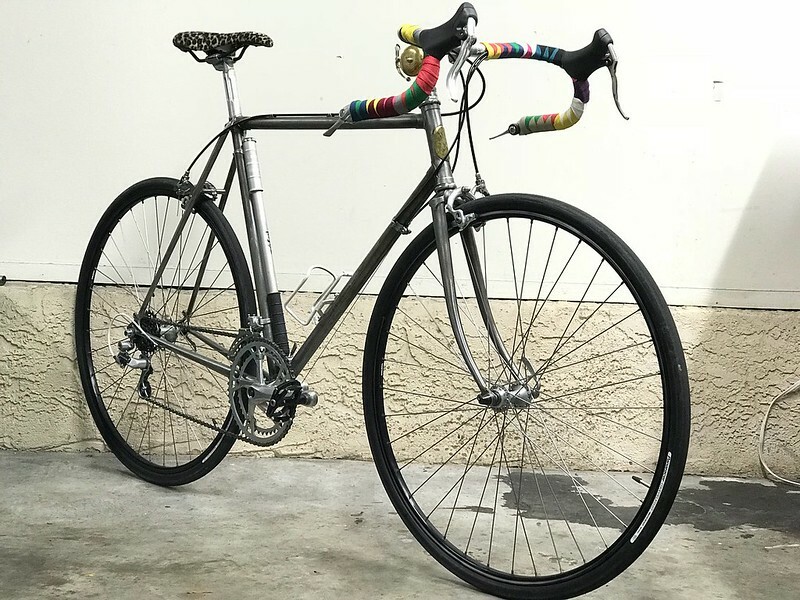 Replaced many steel parts with aluminum (crank, stem, handlebar, seat post, brake levers) reduced the drivetrain to a 1x5 with a 44T chain ring and slapped some paint on. It weighs around 30lbs. Rims are chromed, made in Netherlands, tires are some Continentals.I think I stayed under 80 bucks for the whole built. Now since it's ready it has rained every day, so I can't take it out yet. spent the rest of the day polishing the Schwinn approved parts and painted frame and fork. Went to the Encino Velodrome Swap Meet this morning looking for new rims. No rims, but came home with a long sleeve Jersey and a new rain/wind jacket for those chilly California mornings. This afternoon, I got the old Super Course out for a quick ride before tomorrow's Pasadena Vintage ride. I came out empty handed this time from the Encino swap. Last week I respoked the Araya/600 wheel set that came with my 86 Ironman. Today, I finally corrected an error. I had to remove the head-in spokes and twist the hub the "other" way so that there were Parallel spokes adjacent to the valve hole. PHEW! I feel much better. If it's not howling tomorrow, I'll take the Peugeot to Pasadena tomorrow. After decorating the outside of the house I decided one of the winter project bikes needed something too. 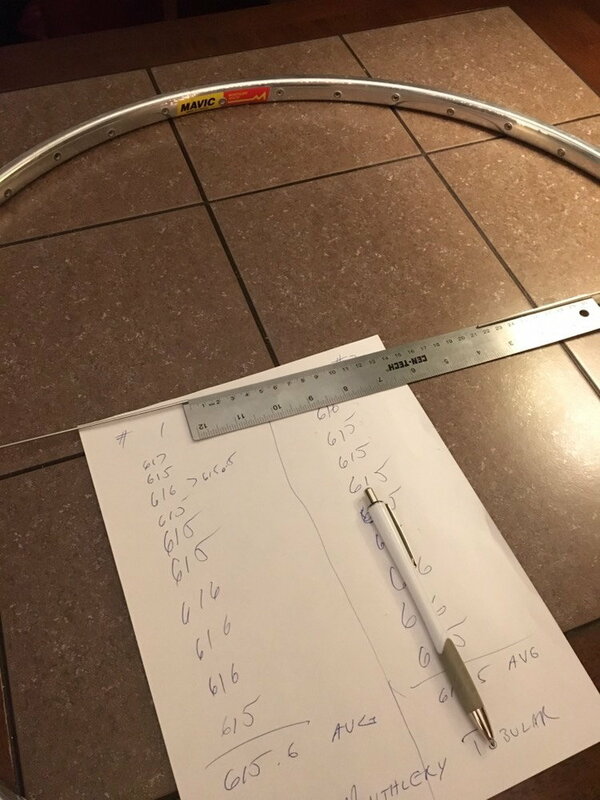 Measuring the ERD on some NOS Mavic Monthlery Tubular rims, so I can order spokes. I spent a few minutes cleaning (a.k.a. wiping dust off) these shifters. 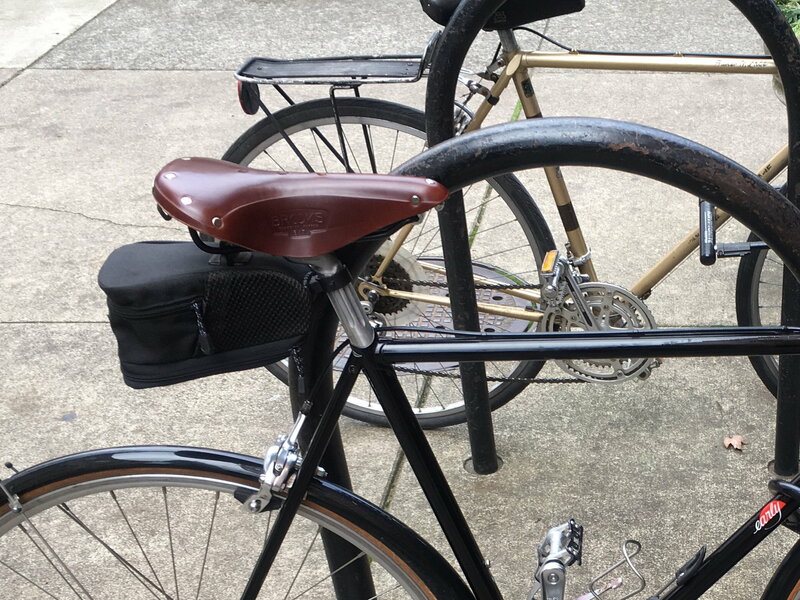 Yesterday, on my morning commute, my left brifter was extremely reluctant to shift down, and the right one was slightly reluctant. I brought the bike into my office and sprayed WD-40 into both brifters. No trouble for now. 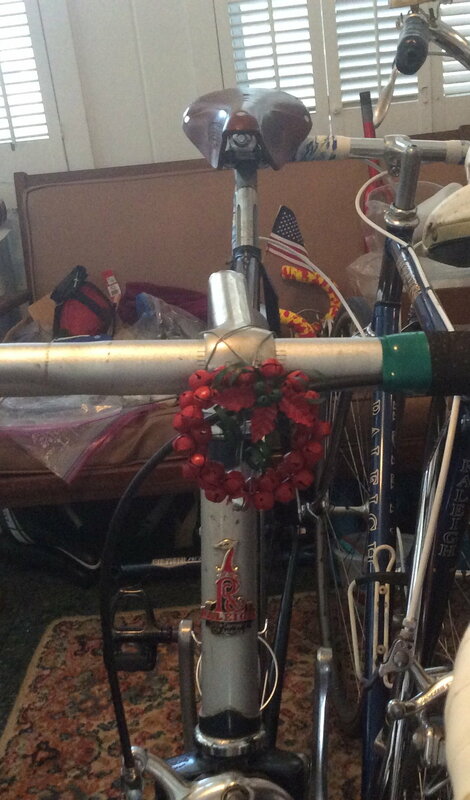 This was on my normal commuting bike, a 1974 Raleigh International Frankenbike with a 3x10 (overkill) drivetrain. I revisited this bike in the past couple months and gave it a proper paint job. I had to get rid of the harlequin, but thanks to the BoC I had an equally eye-catching replacement. 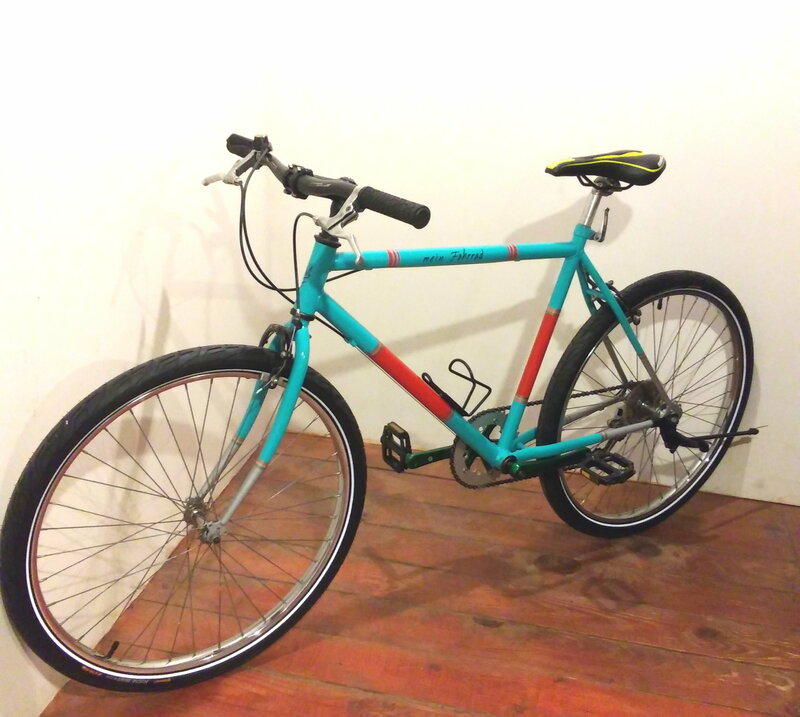 Same components, new wheelset, some Tourney brakes and well-worn fenders. Looking forward to a long ride tomorrow morning, it's been too long! Currently on the bus returning home to Eugene after a trip up to Portland for sweet little early 80’s Columbus SL tubed bike. It’s stowed away loosely in the lower cargo bays, causing my blood pressure to rise at every single bump along the road. I’ll probably pedal in down to the co-op once back in town as way way to unwind, and to simply see what’s in store there lately. Not riding much the past couple of weeks while recovering from surgery and unrelated sinus/respiratory infection. So I'm gradually redoing the '89 Centurion Ironman Expert and '92 Univega Via Carisma. I'm mostly keeping the Ironman original, and finally getting the Accushift indexing to work properly. Had to sort through a few changes of freewheels, chains, cables and housings to get it running acceptably. I can hear just a wee bit of chain noise indoors in some gear combinations but not while riding outside. Close enough. The Univega is morphing from its original mountain bike-lite configuration to a proper city bike. Nitto albatross handlebar to replace the original flat and later replacement riser bars. 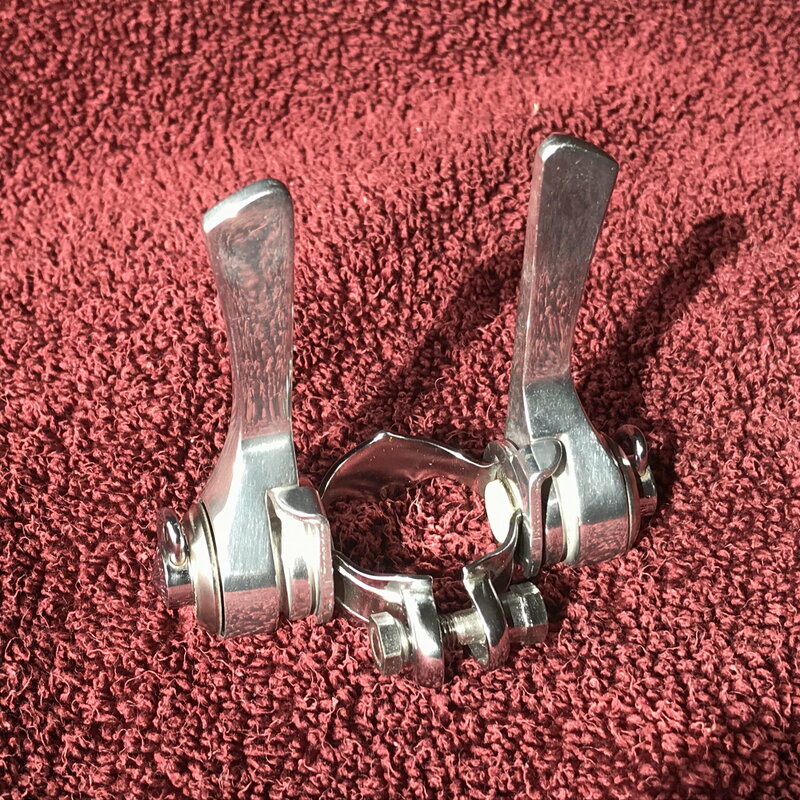 Borrowed bar end shifters -- I like 'em so well I'll need to buy a set. 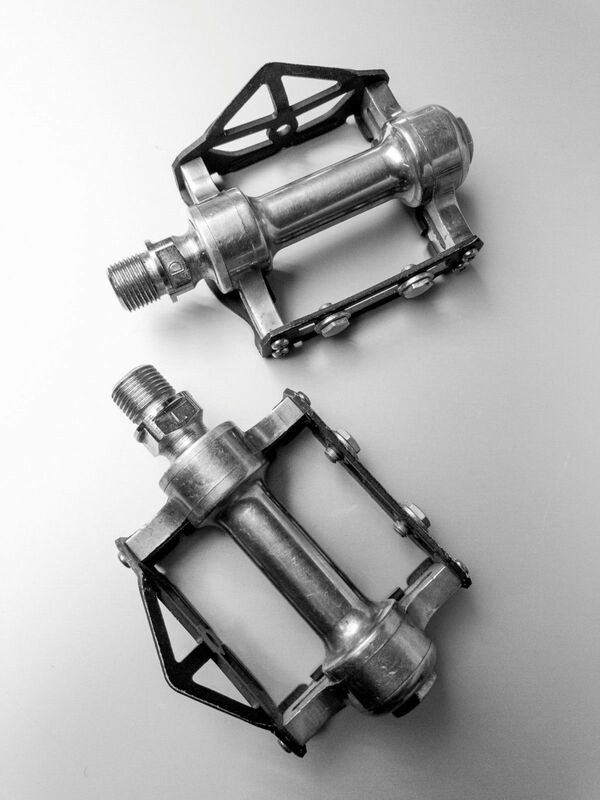 8 -speed 12-32 cassette to replace the 7-speed 13-28. Only works in friction mode with the bar end shifters but works well enough I won't miss indexing, and I'd already been using a set of cheap but functional SunRace SLM10 friction thumb shifters for a couple of years since the original Shimano STI thumbies broke. New wheels to replace the originals that were damaged when I was hit by a car last spring. Narrower rims and tires, 700x32 Conti Contact Sport II to fit a set of Bluemel fenders sitting in the closet. Ditto, a rear rack after the fenders are done. Might replace the up-angled stem with a horizontal road bike stem to get the albatross bar a bit lower, in which case I'll need to replace the cable housing hanger. 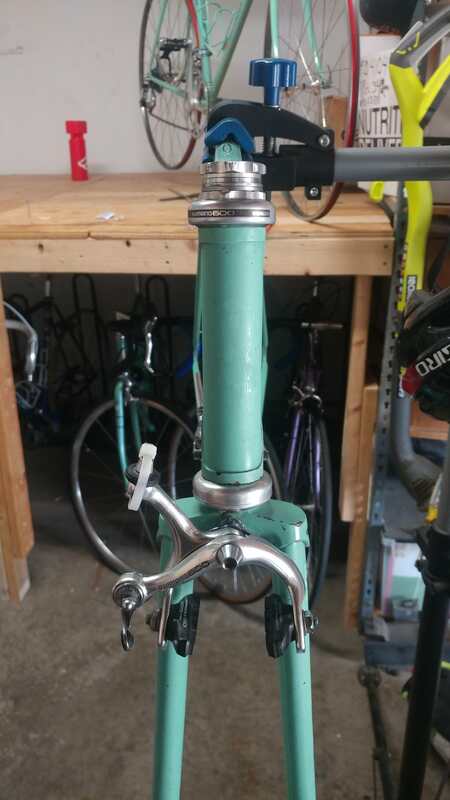 Or maybe try flipping the albatross bar on the original stem. And waiting for Nashbar to deliver a Selle Italia Q-Bik saddle. Hoping it'll be right for the Univega in the new configuration. I've swapped between three older saddles I already had and haven't found one that's right for every occasion. Depends on whether I'm wearing shorts or jeans, lightweight summer shoes or winter boots, etc. I might eventually get a Selle Anatomica since most folks seem happy with 'em for this type of relaxed ride. Dean that's a neet tool. Does that work for the install, and what did you make it out of? I started with a 7/16" bolt with coarse threads. Most important is for the expander cone to have a diameter that will fit inside the bore of the hub. In this case, I used 0.400". 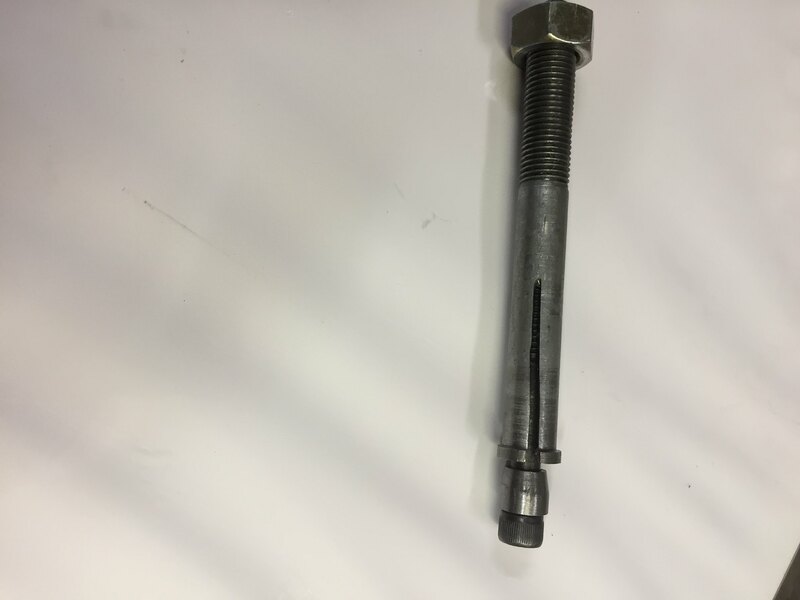 The allen head bolt that forces the cone into the bore of the puller is 1/4" with coarse threads. Once I had all of the machining/taping done, I cut the 3 slits you see with a die grinder fitted with a thin abrasive wheel. I don't use this tool for the install because I was concerned it may not pull in "straight". Instead, I made another tool that is ~5/8" long and a few thousandths smaller in OD than the OD of the bearing cup. One end is turned down to a diameter that just fits inside the cup. This piece is center bored to 3/8". 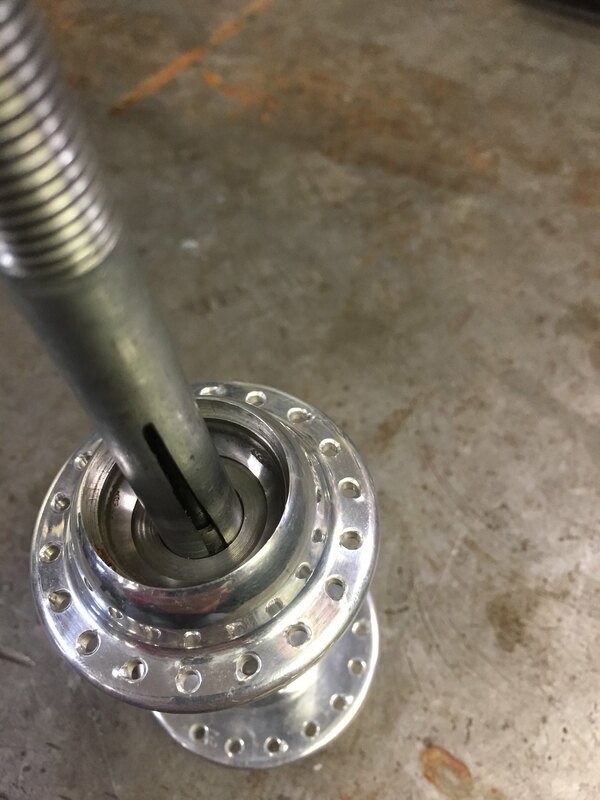 I use a short length of 3/8" all-thread rod to pull the replacement cup into the hub....see picture below. I have used both tools to replace bad cups on 6 - 8 hubs now. They have worked perfectly every time. A few more thoughts.... All of this is made easier because I have a small metal lathe (South Bend 9") and some primitive machining skills. I made a second version of this tool that works with the Campy Record front hubs. 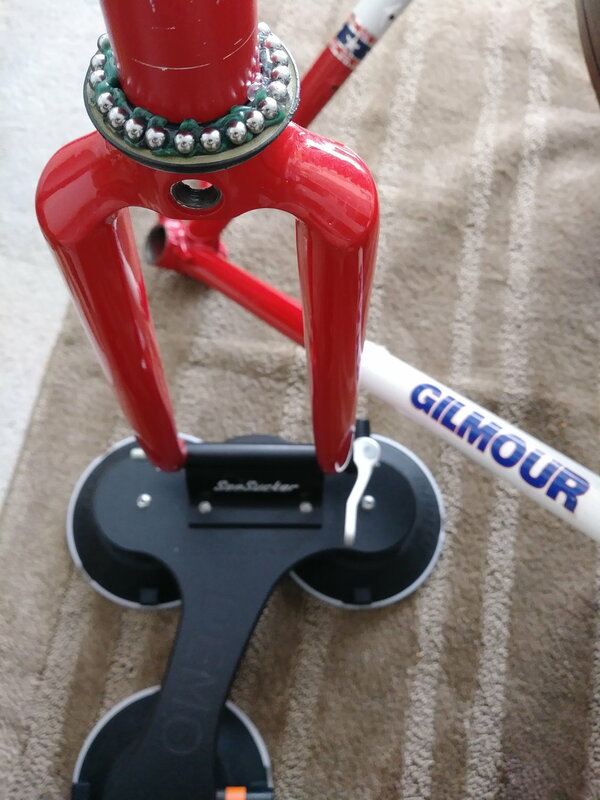 I discovered Shimano Dura-Ace 7400 hubs are similar to Campy Record in that the inside diameter of the cup is smaller than the bore of the hub.....so there is a protruding "lip" for the tool to grasp. I've "saved" a few of these D-A 7400 hubs with the same tools. If you or others would like more detail.....I could make a drawing if you like.....please feel welcome to send me an email at dean.reed@olypen.com. Those Barelli pedals are high on my "dream components" list. 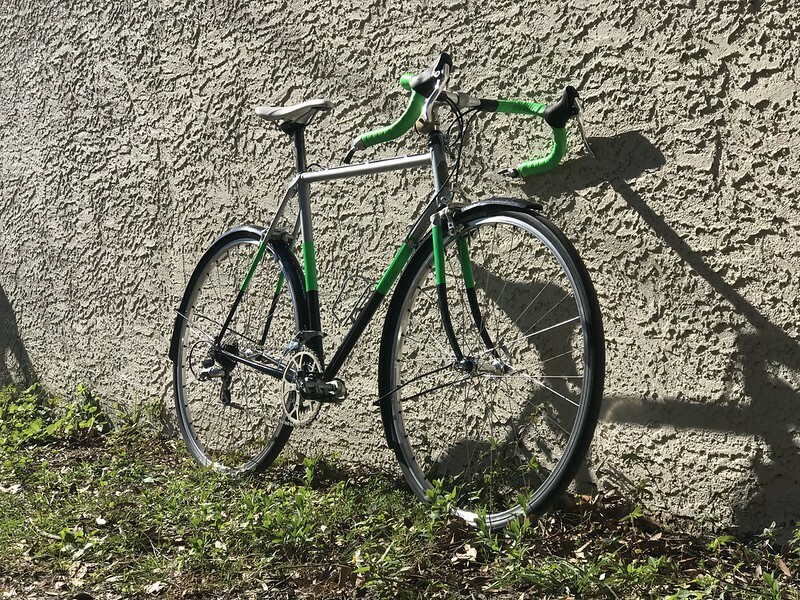 I've been holding off on tearing down a Miyata Titanium bike until I gathered a groupset. What was on there was what looked like a parts bin build. Also, there were a few issues with riv nuts and lugs that I wanted to get a second opinion on. So off to the LBS with frame in hand. All the mechanics there were guys I've traded with and shot the bull. After getting some good advice and sorting out a few parts, the cashier noted I was a long time customer. I guess my account number there is "5", lol.